Leading lines composition technique is the easiest to understand and apply in landscape photography. In fact, we compose some photographs using leading lines unknowingly! You may have done that too, it comes to us naturally. Let me show you, using an example. Imagine you are driving through a forest, and you see beautiful line of trees on either side of the road. The autumn leaves are so breathtakingly colorful, that you couldn’t help but pull your car to a side. You want to capture that beautiful moment in your camera. Now…how would you photograph it? 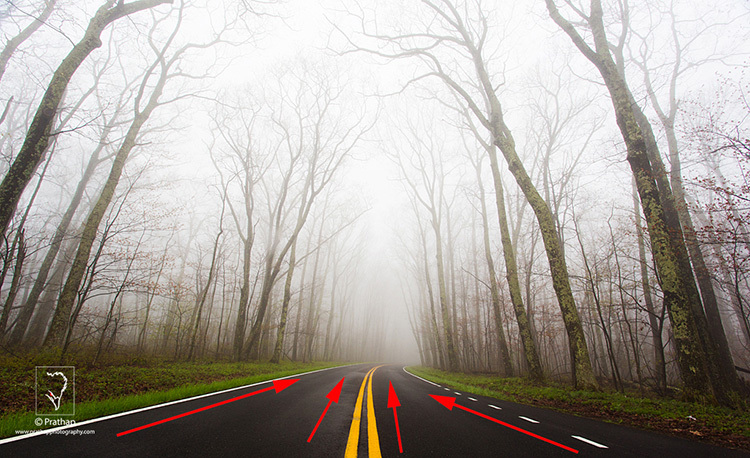 Would you stand parallel to the road and just take trees on one side of the road, or would you consider taking a photograph standing right in the middle of the road, with trees on either side? Invariably, you would likely consider the latter approach. Right? Of course, you don’t want to stand in the middle of a busy road, just be careful when you do it. Don’t hang me for this idea. 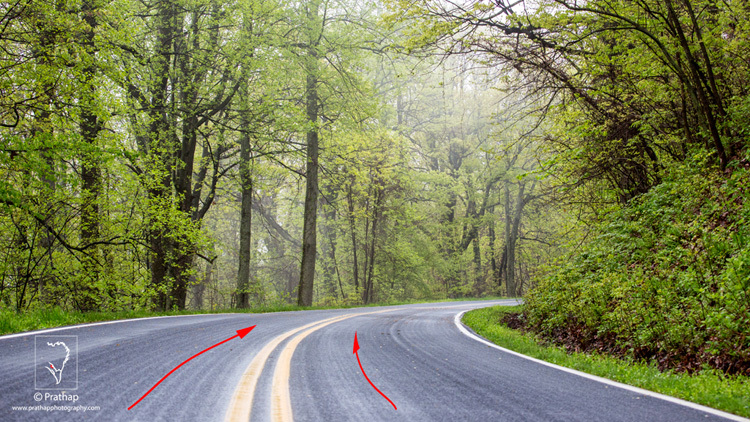 When you photograph the road running from the bottom, to the center of the image, you are using the leading lines composition technique, and the road serves as the line. Simply put, a leading line is a one that leads you from one point to another in your image. Our eyes naturally follow the line unconsciously. Check it out now. Your eye will invariably follow the line from left to right (or right to left). Look at the examples below. Your eye connects the dot subconsciously. You make a line, a triangle, and a square! That’s the power of the line. 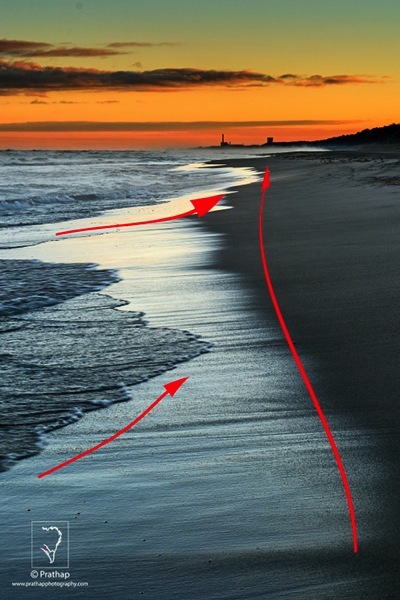 This very nature of ours is exploited in photography, by composing an image using leading lines. 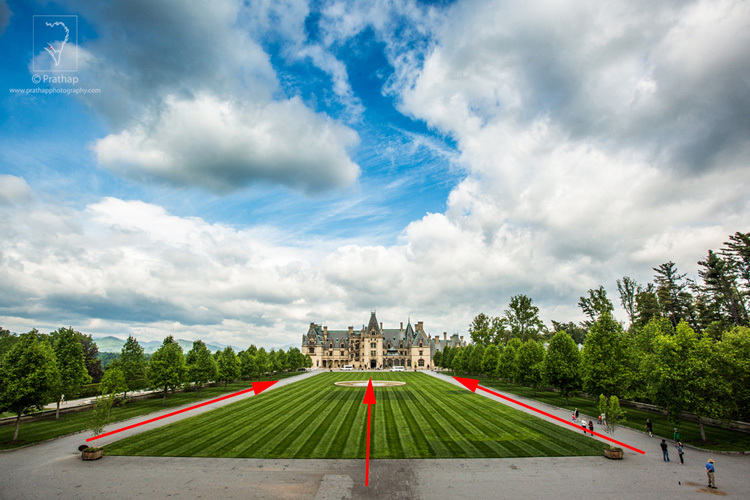 By using this technique, you can force the viewer to follow the line, taking them on a visual journey. The journey becomes more interesting when you have some high drama surrounding the line. It is one of the simplest, and most powerful composition techniques used in the landscape photography. Landscape photographers always look for leading lines in nature, to create a sense of depth in the image, and also to lead the viewer to the main subject of interest. The idea is to lead the viewer into the scene with the help of literal, or imaginary/implied lines, in the scene. The photograph becomes much more interesting when this line leads the viewer to the main subject of interest, or an anchor point. Leads the viewer into the photograph. Leads the viewer from one point to another. Leads the viewer to the main subject of interest. Creates the illusion of depth, that is much needed in landscape photographs. 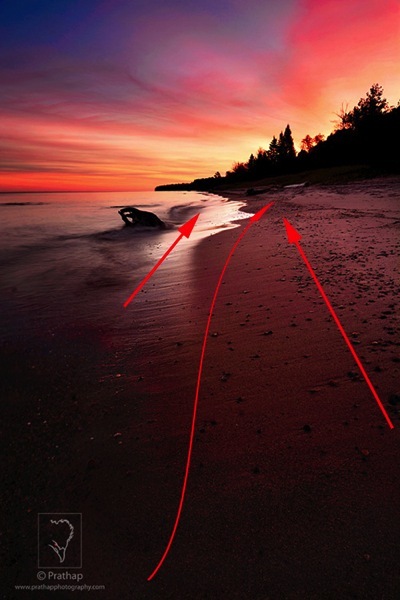 You can make most the compelling landscape photographs, by combining leading line composition technique, with the Rule of Thirds. Below is one such example where I have used leading lines to guide the viewer from the foreground, all the way to the background. Also, I have placed the horizon on the upper third of the frame, following the Rule of Thirds, and creating a dynamic landscape photograph. Series of trees, poles, etc. The list can go on. 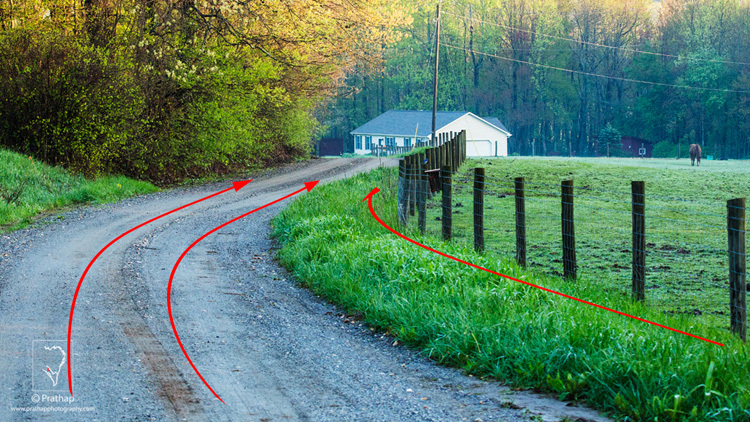 It’s amazingly simple to use leading lines in your landscape photographs, you just have to look around. 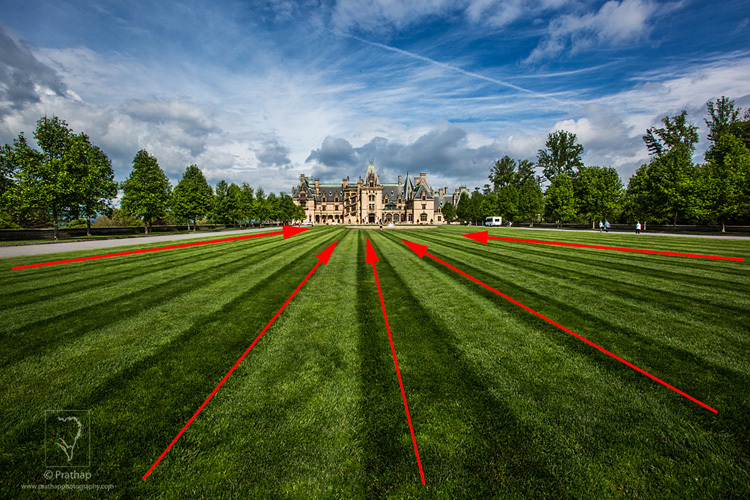 Leading lines can be straight or curved, and straight lines can also be horizontal, vertical, or diagonal. A horizontal line induces a feeling of calmness, whereas a vertical line represents strength. Diagonal lines can be very interesting as they represent energy. If used properly, diagonal lines can make a dull image look more compelling. A curved line makes it for an interesting composition, as it spirals around the frame asking for more attention. The viewer will eventually scan more parts of the image. An s-curve is predominantly preferred by many landscape photographers, for its ability to connect many parts of the image. It gives a soothing feeling in the viewer. 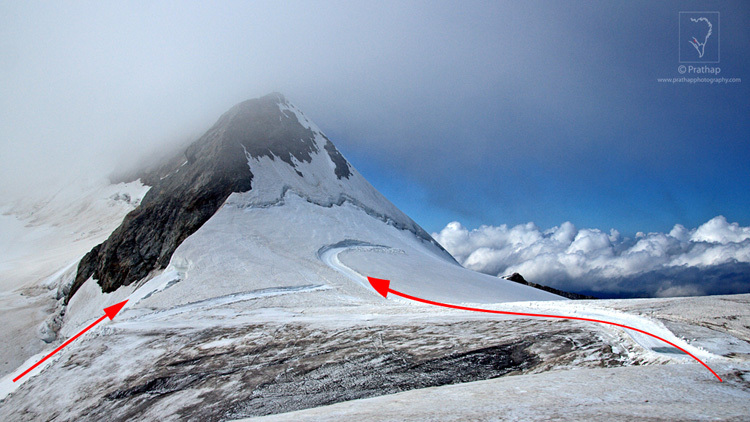 A tighter curve, however, might induce sense of danger. The most important point is to use the leading lines to direct the viewer into the scene. It wouldn’t make much sense, or be effective, if it leads the viewer out of the scene. Leading line photographic composition is the most powerful natural technique a landscape photographer can use to lead the viewer into the photograph. When combined with the Rule of Thirds, you can make some compelling photographs. 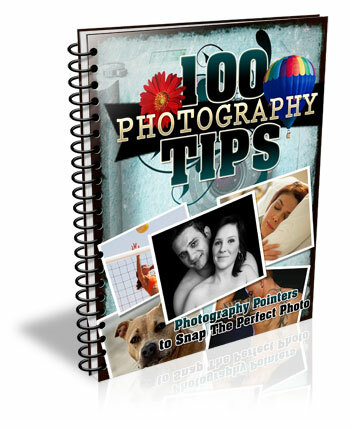 It is by far the easiest method to create a 3-dimensional effect, in a 2-dimensional photograph. Landscape photographers use this very effectively to force the viewer to scan the photograph from foreground to background. Embrace it now, and see how it transforms your landscape photographs into something more realistic and interesting. Think photography! Think Simple! How do you use leading lines in your photography? Please share in the comments below. The post How to Use Leading Lines Effectively in Landscape Photography by Prathap DK appeared first on Digital Photography School. Next Post: Exposure: Get it Right in Camera or Fix it Later?